Aim: This study aims to establish the quality assessment methods of Pollen Typhae. 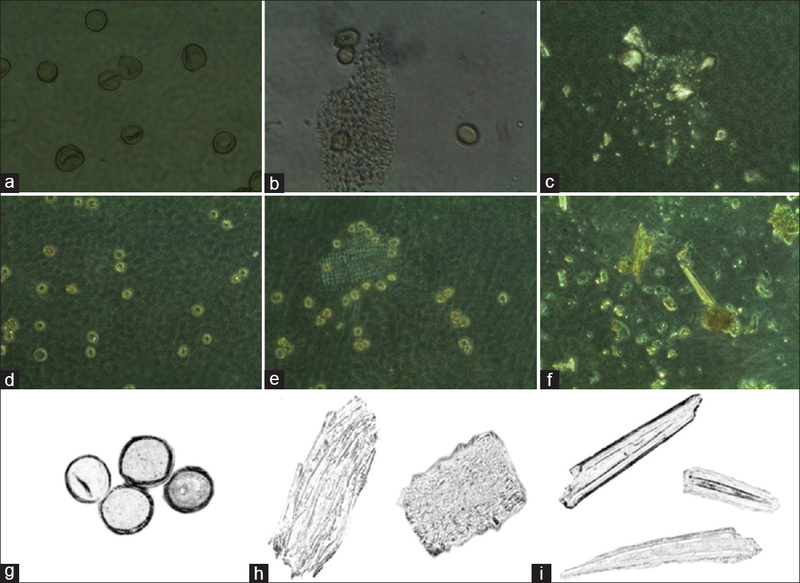 Materials and Methods: High performance liquid chromatography (HPLC) fingerprint analysis, hierarchical cluster analysis (HCA), and principal component analysis (PCA) were used for quality evaluation of Pollen Typhae from different origins together with microscopic identification. Then, the quantity of 43 crude Pollen Typhae samples in the market was collected and analyzed. Results: In true and false test, four False Pollen Typhae samples, 13 Net Pollen Typhae (NPT) samples, and 26 Grass Pollen Typhae (GPT) samples were identified by microscopic identification. In quality test, the amounts and percentages of Qualified Pollen Typhae, Unqualified Pollen Typhae were 24 (55.81%) and 19 (44.19%), respectively with typhaneoside and isorhamnetin-3-O-neohesperidoside determined by HPLC according to China Pharmacopeia. We analyzed 43 samples from 20 regions and established their fingerprints, then selected 31 peaks as characteristic peaks and calculated their relative peak areas. 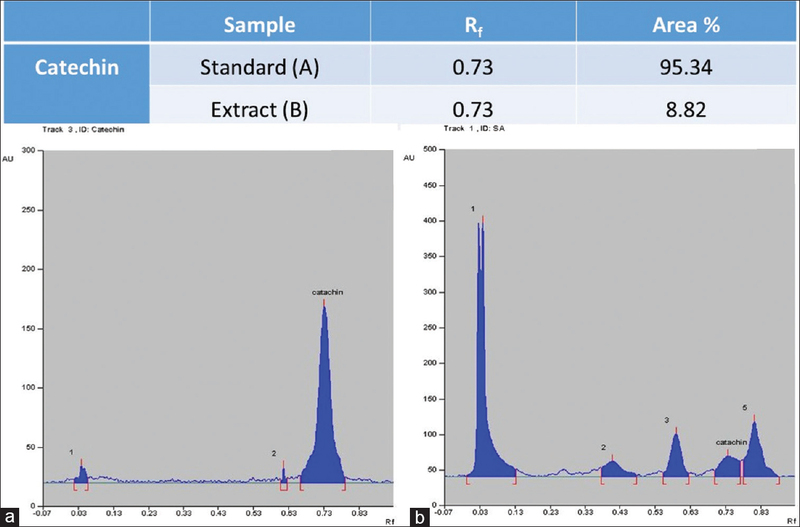 To express the HPLC fingerprints quantitatively, peak 16, 18, 22, 23, and 26 were verified as typhaneoside, isorhamnetin-3-O-neoheptanoside, rutin, quercetin, and isorhamnetin. 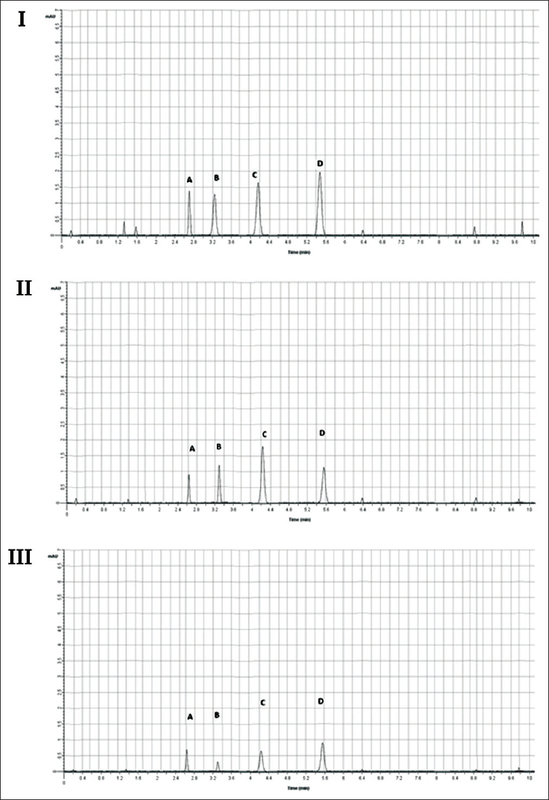 The similarity of correlation coefficients in chromatogram was 0.954 ± 0.007 and 0.922 ± 0.004 for NPT and GPT, respectively, while 0.67 ± 0.008 for 43 samples. The analysis of HCA and PCA can distinguish true or false, qualified or unqualified of Pollen Typhae. Conclusion: HPLC fingerprint combined with HCA and PCA provides a very efficient and comprehensive method for quality evaluation of Pollen Typhae. Abbreviations used: HCA: Hierarchical cluster analysis; PCA: Principal component analysis; FPT: False Pollen Typhae; NPT: Net Pollen Typhae; GPT: Grass Pollen Typhae; QPT: Qualified Pollen Typhae; UPT: Unqualified Pollen Typhae; RSDs: The relative standard deviations; CASE: Computer Aided Similarity Evaluation; TCM: Traditional Chinese medicine. Background: Chamuangone has been isolated from Garcinia cowa leaves and exhibited various biological activities, i.e., antibacterial, anti-Leishmania major, and cytotoxic activity against cancer cells. n-Hexane has been reported to be the most suitable solvent for extraction of chamuangone. Objectives: Some vegetable oils were determined as an alternative green solvent for extraction of an anticancer compound, chamuangone from G. cowa leaf. The chamuangone-enriched extract was standardized and evaluated for cytotoxic activity against human cancer cell lines. Materials and Methods: Microwave-assisted extraction and high-performance liquid chromatography were used for extraction and standardization. The cytotoxic activity was determined using a sulforhodamine B assay. Results: The chamuangone-enriched extract was obtained using rice bran oil as the alternative green solvent and standardized to contain 1.97 mg/mL chamuangone. 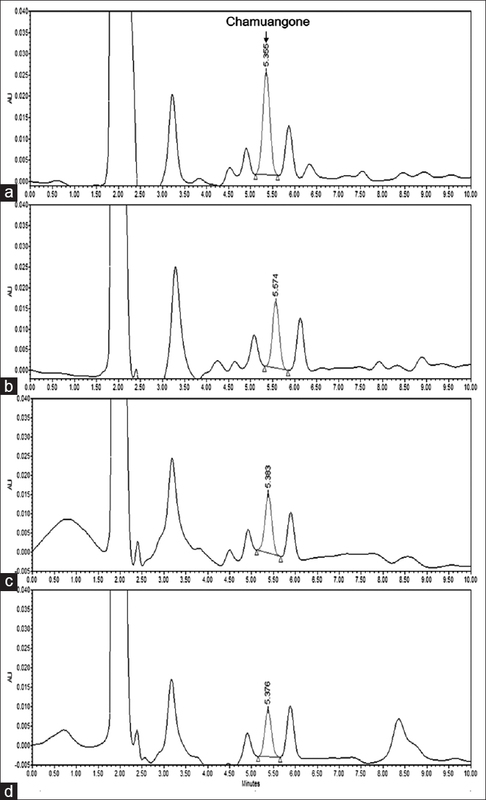 The extract exhibited cytotoxic activity against human lung adenocarcinoma, human breast adenocarcinoma, and human colorectal adenocarcinoma cell lines, with IC50 values of 15.3, 15.9, and 12.8 μg/mL, respectively, but was nontoxic to human gingival fibroblasts, a normal cell line, at a concentration of 50 μg/mL. Moreover, the extract contained several natural antioxidants, including α-tocopherol (76.7 mg/100 g), γ-oryzanol (cycloartenol ferulate: 67.1 μg/mL and 24-methylenecycloartanol ferulate: 85.6 μg/mL), and antioxidant capacity determined as ascorbic acid (258.7-mM ascorbic acid equivalent per gram). Conclusion: Based on these findings, the chamuangone-enriched extract may be considered as a novel functional food in cancer chemopreventive action. Abbreviations used: AAE/g: Ascorbic acid equivalent per gram; CEO: Chamuangone-enriched Garcinia cowa leaf extract with rice bran oil; DMEM: Dulbecco's Modified Eagle Medium; FBS: Fetal bovine serum; HGF: Human gingival fibroblasts; HPLC: High-performance liquid chromatography; IC50:50% Inhibitory concentration; MAE: Microwave-assisted extraction; MHz: Megahertz; MUFAs: Monounsaturated fatty acids; NMR: Nuclear magnetic resonance; ODS: Octadecylsilane; PUFAs Polyunsaturated fatty acids; SD: Standard deviation; SFAs: Saturated fatty acids; SRB: Sulforhodamine B; TCA: Trichloroacetic acid; UFAs: Unsaturated fatty acids; UV: Ultraviolet; W: Watt. Background: The present study was the first attempt to explore the characteristics of ginsenoside-Rg3 (Rg3) on release of catecholamines (CA) in the perfused rat adrenal medullae and also to verify the underlying action mechanism. Materials and Methods: The adrenal medulla was separated by some modification of the previous method and perfused with Krebs solution. CA was assayed directly by the fluorometry. Results: Rg3 reduced acetylcholine (ACh)-produced CA release in a dose- and time-dependent manner. Rg3 time-dependently depressed CA release produced by 3-(m-chloro-phenyl-carbamoyl-oxy)-2-butynyltrimethyl ammonium chloride (McN-A-343), 1,1-dimethyl-4-phenyl piperazinium iodide, and angiotensin II. In the presence of Rg3, the CA release produced by high K+, veratridine, cyclopiazonic acid, and methyl-1,4-dihydro-2,6-dimethyl-3-nitro-4- (2-trifluoromethyl-phenyl)-pyridine-5-carboxylate (Bay-K-8644) was also markedly suppressed. However, during the simultaneous perfusion of Rg3 and Nω-nitro-l-arginine methyl ester hydrochloride (l-NAME), the release of CA produced by ACh, angiotensin II, Bay-K-8644, and veratridine was restored closely to the level of each control, in contrast to that of Rg3-treatment alone. The nitric oxide (NO) release was significantly elevated by Rg3-treatment. Furthermore, in the coexistence of Rg3 and fimasartan, ACh-produced CA release was more significantly reduced as compared to that of fimasartan-treatment alone. Conclusions: We present the first evidence that Rg3 markedly depresses the CA secretion produced by activation of neuronal cholinergic and angiotensinergic receptors. Rg3-produced inhibition appears to be evoked not only by blocking the inflow of Na+ and Ca2+ into adrenomedullary cells but also by preventing the Ca2+ release from intracellular storage, partly through enhancement of NO release by NO synthase activation. Coadministration of Rg3 and fimasartan may be clinically beneficial for the treatment of cardiovascular diseases. Abbreviations used: Rg3: Ginsenoside-Rg3; VDCC: L-type voltage-dependent Ca2+ channels; Bay–K-8644: Methyl-1,4-dihydro-2,6-dimethyl-3-nitro-4-(2-trifluoromethyl-phenyl)-pyridine-5-carboxylate; ACh: Acetylcholine; McN-A-343: 3-(m-chloro-phenyl-carbamoyl-oxy)-2-butynyltrimethyl ammonium; DMPP: 1.1-dimethyl-4-phenyl piperazinium; NO: Nitric oxide; L-NAME: Nω-nitro-l-arginine methyl ester; nNOS: Neuronal NO synthase. Background and Objective: With regard to the uniqueness of the red algae of the genus Laurencia as the source of C15-acetogenins, along with the diversity of biological applications; the acetogenin content of the Red Sea Laurencia obtusa was investigated. Materials and Methods: Fractionation and purification of the CH2Cl2/MeOH extract were carried out by applying several chromatographic techniques, including column and preparative thin-layer chromatography; followed by a series of 1H nuclear magnetic resonance measurements to give rise of some interesting notes. Toxicity to Artemia salina was evaluated. 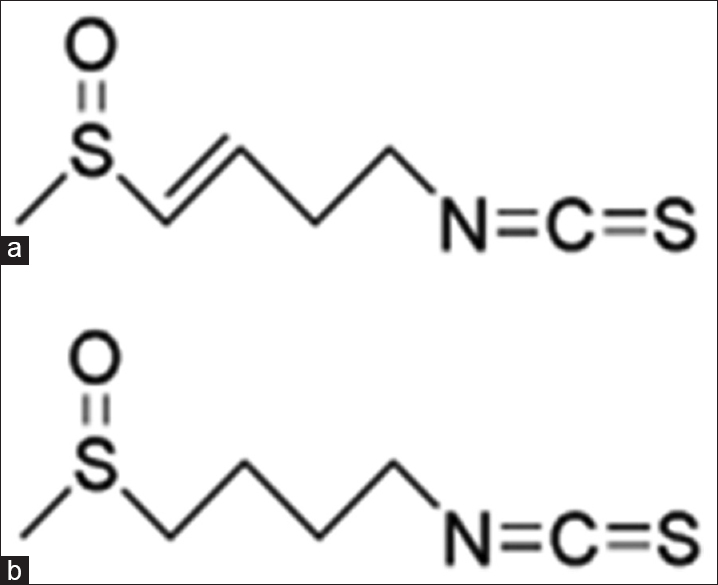 The apoptosis induced by these two compounds was demonstrated by DNA fragmentation assay and microscopic observation. 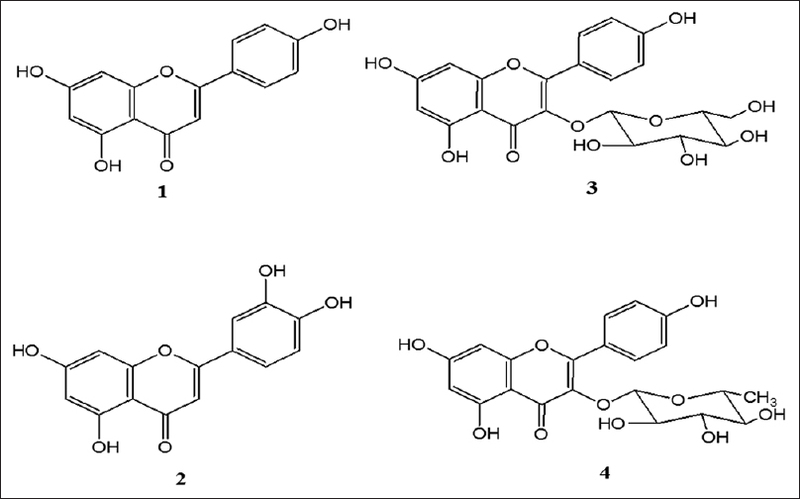 Results: A new rare chloroallene-based C15 acetogenin, laurentusenin (1) along with a new furan ring containing C15 acetogenin, laurenfuresenin (2), were isolated from the red alga L. obtusa. Comparing 1D and 2D NMR, MS, ultraviolet and infrared radiation spectral data for the newly isolated compounds with the reported bromoallene containing acetogenins spectral data was played the crucial role for characterization of their chemical structures. 1 and 2 exhibited bare toxicity (LD50 >12 mM) in test organism, A. salina and induced apoptotic death confirmed by DNA fragmentation and microscopic investigations. Conclusion: The isolated metabolite 1 showed unusual substituted allene side chain, while 2 inserted furan ring as a new acetogenin nucleus. Both compounds may play a role in apoptosis induction and initiation and propagation of inflammatory responses. Abbreviations used: NMR: Nuclear magnetic resonance; MS: Mass spectrometry; UV: Ultraviolet spectroscopy; IR: infrared radiation; EIMS: Electron ionization mass spectra; TLC: Thin-layer chromatography; PPP: Platelet poor plasma; PRPDS: platelet-rich plasma derived serum. DEPT: Destortionless Enhancement by Polarization Transfer; NOESY: Nuclear Overhauser Effect Spectroscopy; HSQC: Heteronuclear Single Quantum Coherence; HMBC: Heteronuclear Multiple-quantum Correlation; 1H-1H COSY: Correlation Spectroscopy. Background: Endophytic fungi attracted attention as a prolific source of bioactive natural products with a potent pharmaceutical activity and unique structure. Objective: The main goal of the study is to separate and identify the bioactive constituents from the endophytic fungus Fusarium sp. as well as to evaluate the antimicrobial of the new metabolites. Materials and Methods: The fungus was cultured on a rice medium, and then, the cultures were extracted with ethyl acetate (EtOAc). The EtOAc extract was chromatographed utilizing different chromatographic methods to give five metabolites. The structural determination of these metabolites was carried out by the analyses of various spectroscopic data, in addition to comparison with the formerly reported data. The antifungal and antibacterial potentials were evaluated toward various microbial strains using disc diffusion assay. 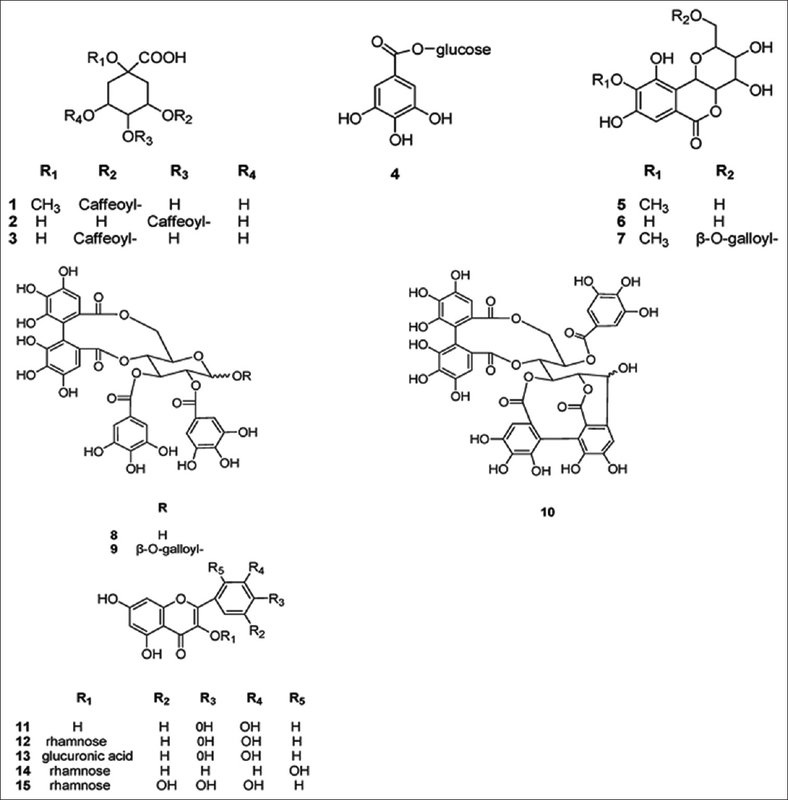 Results: A new aminobenzamide derivative, namely fusaribenzamide A (2), and four known metabolites: (22E,24R)-stigmasta-5,7,22-trien-3-β-ol (1), adenosine (3), p-hydroxyacetophenone (4), and tyrosol (5) were isolated. Fusaribenzamide A (2) possessed significant antifungal activity toward Candida albicans with minimum inhibitory concentration (MIC) value 11.9 μg/disc compared to nystatin (MIC 4.9 μg/disc). Conclusion: The endophytic fungus Fusarium sp. could be considered as a wealthy pool for the isolation of aminobenzamide derivatives. Fusaribenzamide A may be a candidate for the discovery of a promising antifungal agent. Abbreviations Used: CC: Column chromatography; CHCl3: Chloroform; COSY: Correlations spectroscopy; DBE: double bond equivalent; EtOAc: Ethyl acetate; DMSO: Dimethyl sulfoxide; H2SO4: Sulfuric acid; HMBC: Heteronuclear multiple bond correlation experiment; HRMS: High-resolution mass spectrometry; HRESIMS: High-resolution electrospray ionization mass spectrometry; HSQC: Heteronuclear single quantum correlation; IR: Infrared; IZD: Inhibition zone diameter; KBr: Potassium bromide; LTQ: Linear trap quadrupole; MeOH; Methanol; MIC: Minimum inhibitory concentration; NMR: Nuclear magnetic resonance; RP: Reversed phase; SiO2: Silica gel; TLC: Thin-layer chromatography; UV: Ultraviolet; VLC: Vacuum liquid chromatography. Background: Saussurea lappa (S. lappa, Asteraceae) have immunomodulatory effects and used in the management of many metabolic disorders. Gestational diabetes is one of the metabolic disorders affecting globally one in seven pregnant women. Objectives: The aim of the current study is to optimize an infrared-assisted extraction (IR-AE) method for S. lappa bioactive constituents, phytochemically investigate its content, isolate its most active constituent, and to assess their biological effects against gestational diabetes. Materials and Methods: To optimize IR-AE conditions, four main factors were studied including solvent concentration, extraction time, powder size, and IR power in the yielded extract (SL-IR). Reversed-phase high-performance liquid chromatography coupled with bio-guided fractionation and isolation procedures using 1H and 13C NMR method were utilized. Solid–liquid (SL-SLE) and ultrasound (SL-US) extraction methods were also done. Results: The optimal IR-AE extraction conditions were found to be 20% aqueous phase concentration, 60-min extraction time, 70 mesh powder size, and 70 W IR power. Phytochemically, four major lactones were identified, including costunolide, dehydrocostuslactone, isoalantolactone, and alantolactone (ATL). ATL was the most active lactone. SL-IR, SL-US, SL-SLE, or ATL showed a significant (P < 0.05) and dose-dependent hypoglycemia in pregnant diabetic group, adequate fetus weight percentage elevation and did not show any external anomalies. The best control of gestational diabetes, insulin secretagogue potentials, elevation in serum catalase and reduced glutathione levels, and lipid peroxidation decrease were demonstrated by SL-IR 250 mg/Kg. The antioxidant and the insulin secretagogue activities might be among the main mechanisms, whereby the SL-IR controls gestational diabetes and decreases offspring anomalies. Conclusion: Currently, it is the first time to optimize an IR-AE method for extracting bioactive lactones from S. lappa. The optimized IR-AE technique has shown to be a rapid and efficient extraction method with SL-IR showing superiority in controlling gestational diabetes for pregnant groups coupled with high safety profile on the offspring. Abbreviations used: IR-AE: Infrared-assisted extraction; SL: Saussurea lappa, S. lappa; SL-IR: Saussurea lappa infrared extract; SL-US: Saussurea lappa ultrasound extract; SL-SLE: Saussurea lappa solid–liquid extract; ATL: Alantolactone; NDC: Nondiabetic control; DC: Diabetic control; MTF: Metformin; TBARS: Thiobarbituric acid; GSH: Reduced glutathione; CAT: Catalase; APA: Adequate for pregnancy age; LPA: Large for pregnancy age; SPA: Small for pregnancy age. Background: Dictamnus dasycarpus Turcz., is one of the most frequently used herbal medicine to treat dermatosis associated with psoriasis, pruritus, scabies, and eczema. Objective: We investigated the anti-inflammatory effects of D. dasycarpus extract (DDE) using a mouse model with atopic dermatitis (AD)-like dermatitis. Materials and Methods: The therapeutic effects of DDE on skin lesion, tone of color, and inhibitory effects on histopathological changes and cytokine production in skin tissues were assessed in mice with AD-like dermatitis induced by oxazolone. Results: Topical application of DDE alleviated skin lesions such as erythema, scaling and excoriations, and ameliorated erythema and the melanin index. In addition, DDE effectively prevented skin enlargement induced by oxazolone, while also preventing epidermal hyperplasia, spongiotic change, and hyperkeratosis and reducing the production of tumor necrosis factor-alpha and interleukin (IL)-4 and IL-5 in inflamed tissues. Finally, DDE did not affect changes in body weight and spleen–body weight ratio relative to dexamethasone. Conclusion: These results indicate that D. dasycarpus can be used as a topical agent for inflammatory skin diseases with relative safety. Abbreviation used: HM: Herbal medicine; DNFB: Dinitrofluorobenzene, ICAM-1: Intercellular adhesion molecule-1, AD: Atopic dermatitis, DDE: Dictamnus dasycarpus extract, AOO: Vehicle composed of acetone and olive oil, DEX: Dexamethasone, CBA: Cytometric bead array. Background: Some members of the genus Hypericum have been shown to demonstrate antidepressant-like effects. In Colombia, approximately 54 species of Hypericum have been reported, and only a few have been investigated chemical and pharmacologically. 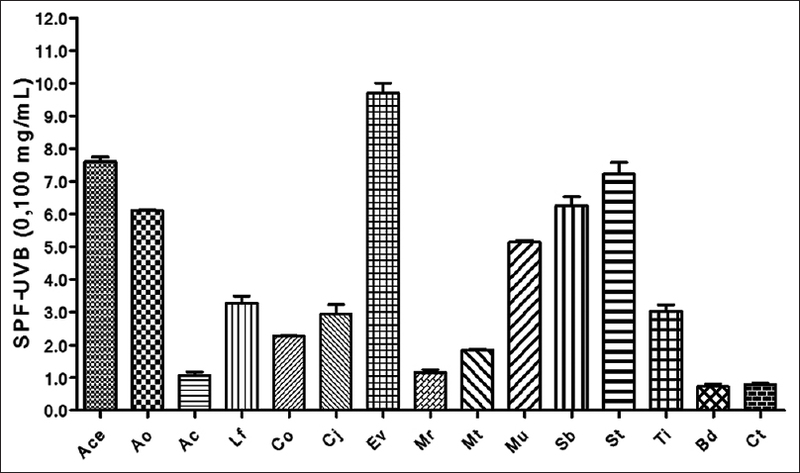 Objective: The aim of this study was to evaluate the antidepressant-like effects of a methanol extract, as well as ethyl acetate and butanol fractions, obtained from aerial parts of Hypericum juniperinum K. Materials and Methods: Behavioral and locomotor activities were evaluated in the open field test (OFT). 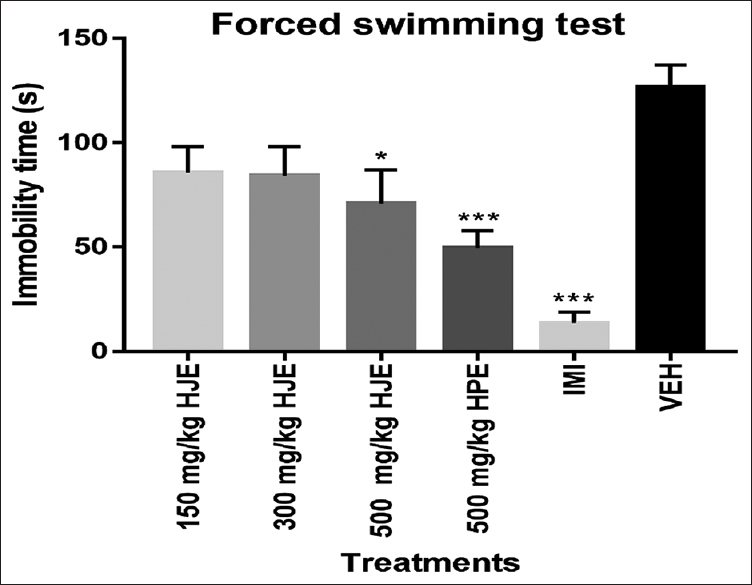 Antidepressant-like activity was measured in the forced swimming test (FST) in male Swiss albino mice. 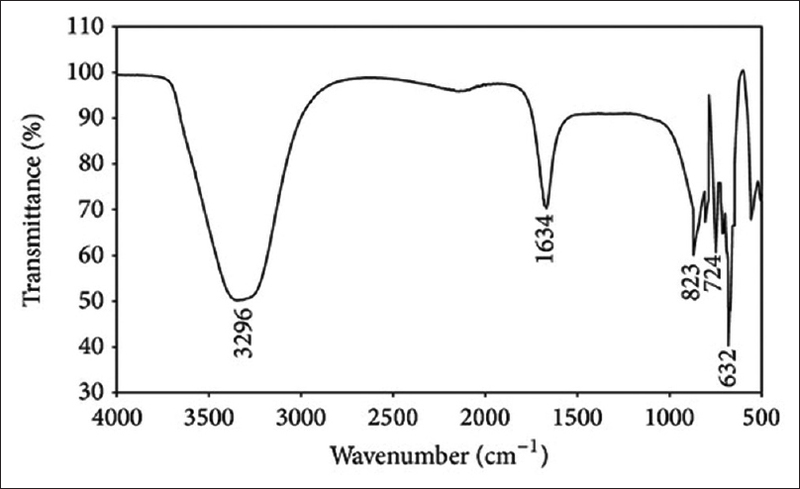 Preliminary phytochemical screening as well as a high-performance liquid chromatography (HPLC) profile of the active fractions of H. juniperinum was performed. Results: Treatment with the methanol extract at 500 mg/kg and the ethyl acetate and butanol fractions at 150 and 300 mg/kg resulted in a decrease in the immobility times in FST. In the OFT, none of the treatments presented altered behavior or locomotor activity of mice. Preliminary phytochemical screening identified terpenes/steroids, flavonoids, phenol derivatives, tannins, and saponins. 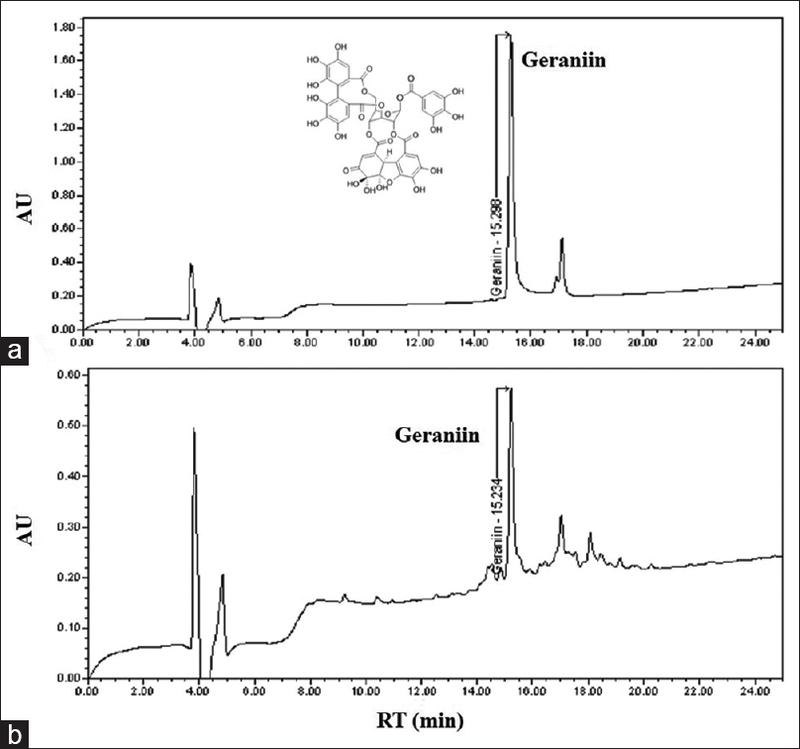 In the HPLC analysis of the fractions, rutin, quercitrin, and quercetin were identified with the help of coinjection of standards. Conclusion: This is the first report of the antidepressant-like activity of extracts and fractions obtained from H. juniperinum in the FST model of depression. Flavonoids may be responsible for the antidepressant-like action of H. juniperinum. Abbreviations used: FST: Forced swimming test; HJE: Methanol extract of Hypericum juniperinum; HJEAF: Ethyl acetate fraction obtained from the methanol extract of Hypericum juniperinum; HJEBF: Butanol fraction obtained from the methanol extract of Hypericum juniperinum; HPE: Methanol extract of Hypericum perforatum; HPLC: High-performance liquid chromatography; IMI: Imipramine; MeOH: Methanol; OFT: Open field test; tR: Retention time; UV: Ultra violet; VEH: Vehicle. Background: Methicillin-resistant Staphylococcus aureus (MRSA) is a resistant staph bacterium to several antibiotics causing several lives-threating diseases such as pneumonia and sepsis. Meswak, Salvadora persica, exhibited promising antimicrobial properties before. Objective: Exploring the anti-MRSA activity of S. persica L. metabolites and its mechanism of action on a molecular level. Materials and Methods: Structure elucidation of the isolated metabolites was carried out by spectroscopic data (one-dimensional and two-dimensional nuclear magnetic resonance). The biological activities of the isolated metabolites against MRSA were evaluated and the molecular mode of action against the dehydrosqualene synthase enzyme have been done. Results: Four compounds have been isolated and identifies to be; apigenin (1), luteolin (2), astragalin (3), and kaempferol-3-O-rhamnoside (4). Compounds 1–4 showed good anti-MRSA activities with IC50 values of 10.3, 11.5, 3.5, and 4.5 μg/mL, respectively. In consistent, astragalin and kaempferol-3 rhamnoside showed close high docking scores. Herein, we are reporting the molecular determinates of activity of these new scaffolds as anti-MRSA, which would be of great importance to developing new anti-MRSA candidates. Abbreviations Used: 1D: One-dimensional; 2D: Two-dimensional; CC: Column chromatography; COSY: Correlations spectroscopy; DMSO: Dimethyl sulfoxide; HMBC: Heteronuclear multiple-bond correlation experiment; HRESIMS: High-resolution electrospray ionization mass spectrometry; HSQC: Heteronuclear single-quantum correlation; IR: Infrared; MRSA: Methicillin-resistant Staphylococcus aureus; NMR: Nuclear magnetic resonance; RP: Reversed phase; TLC: Thin-layer chromatography; UV: Ultraviolet; VLC: Vacuum liquid chromatography. Background: Acute lung injury (ALI) caused by endotoxins is a severe complication causing lethal conditions. Prevention of the inflammatory response is necessary to overcome this condition. Tannic acid is a polyphenol known for its pharmacological properties such as antioxidant, antimicrobial, anti-inflammatory, anticancer, antitumor, and antimutagenic. This study aims to investigate the anti-inflammatory mechanism of tannic acid on lipopolysaccharide (LPS)-induced sepsis and ALI in mice. Materials and Methods: Male BALB/c mice were divided into five groups (n = 12) and induced with LPS (50 mg/kg body weight) and treated with tannic acid (25, 50, and 100 mg/kg) after 1 h. The bronchoalveolar lavage fluids were collected to determine the myeloperoxidase activity and levels of inflammatory cytokines (tumor necrosis factor-α, interleukin [IL]-6, and IL-1 β). Nuclear factor-kappa-β (NF-κβ) activities were examined through Western blot analysis, and hematoxylin and eosin staining was done for histopathological alterations of lung tissues. Results: Results of the study showed that tannic acid was able to prevent the infiltration of inflammatory cells and cytokines into the site of ALI which is also connected to the suppression of NF-κβ activation as shown in the Western blot analysis. The histopathological results further support these results. The safety of tannic acid was also proven on the survival of RAW264.7 cells. Conclusion: The anti-inflammatory mechanism of tannic acid on LPS-induced ALI and sepsis can be credited to the inhibition of inflammatory cytokines production mediated by NF-κβ pathway suppression. Abbreviations used: ALI: Acute lung injury; BALFs: Bronchoalveolar lavage fluids; NO: Nitric oxide; COX-2: Cyclooxygenase-2; iNOS: Inducible nitric oxide synthase; TNF-α: Tumor necrosis factor-α; IL-1β: Interleukin-1 β; IL-6: Interleukin-6. Background: Gastric ulcer is also known as stomach ulcer which is complex with multifactor-associated disease and shows high prevalent worldwide. It affects most of the people around the world, and the initiation and progression of the disease are due to the imbalance in the destructive and defensive mechanism and associated factors present in the mucosa of gastric. The current study is interested to evaluate the ethanolic extract of Sargassum fusiforme polysaccharides (SFPee) toward gastric ulcer induced by ethanol in rat model. Materials and Methods: S. fusiforme is a Chinese pharmacopeia and used as a medicinal ingredient. It contains polysaccharides, phlorotannins, and meroterpenoids which are the major contributors for its pharmacological properties. While the polysaccharides are the predominant ingredients, which account for 40%–60% of the algae dry weight. S. fusiforme polysaccharides show a potent antioxidation, anticancer, antiaging, and anticlotting function and thus promote health benefits. However, the mechanisms behind its pharmacological properties remain largely unknown. Here, we assessed the SFPee ameliorative effects on gastric ulcer induced by ethanol in male Wistar rats. We are also interested to identify the molecular machinery involvement of antigastric ulcer property of SFPee in gastric ulcer-induced rats. Results: Based on the investigation, the role of SFPee on gastric ulcer on various molecules, oxidative stress markers, antioxidant enzymes, the expression of nuclear factor-kappa B, IκB, nitrotyrosine, cyclooxygenase-2, and the assessment of the inflammatory response. Conclusion: Our results show that SFPee exhibited significant anti-inflammatory and antioxidant properties against ethanol-induced gastric ulcer by altering various molecules involved in the gastric ulcer initiation. Abbreviations used: SFP: Sargassum fusiforme polysaccharides; CAT: Catalase; SOD: Superoxide dismutases; ROS: Reactive oxygen species; TBARS: Thiobarbituric acid reactive substances. Background: Lead (Pb) is a hazardous environmental and industrial pollutant, which induces hepatotoxicity in both humans and animals. Lead acetate can cause the formation of an oxidative stress, resulting in the increase in the concentration of free radicals and decrease in antioxidant. Chitosan-Pinus merkusii extract nanoparticle has shown to possess powerful antioxidant properties. Objective: In the present study, we investigated the impact of Chitosan-P. merkusii extract nanoparticle against lead acetate-induced hepatotoxicity in rats. Materials and Methods: Chitosan-P. merkusii extract nanoparticle was characterized by dynamic light scattering (DLS) and scanning electron microscope (SEM). The fifty male rats were divided into control group (rats were given daily with distilled water), lead acetate group (rats were injected with lead acetate [15 mg/Kg BW i. p] for the 7 consecutive days), and the treatment group (rats were given the Chitosan-P. merkusii extract nanoparticle [100 mg, 200 mg, and 400 mg/Kg BW orally] once in a day for 11 days and on the 4th day, they were injected with lead acetate [15 mg/Kg BW i. p] for 7 days). On day 11, the rats' blood samples were taken by a cardiac puncture to measure the levels of serum glutamic-oxaloacetic transaminase (SGOT), serum glutamic pyruvic transaminase (SGPT), and alkaline phosphatase (ALP). Furthermore, rats were sacrificed, and liver tissues were collected to evaluate the malondialdehyde (MDA), superoxide dismutase (SOD), and glutathione peroxidase (GPx). The liver tissues also were subjected to histological evaluations and immunohistochemical evaluations of the expressions of caspase-3. Results: The results showed that DLS showed the formation of Chitosan-P. merkusii extract nanoparticle with the size of 530.2 ± 30.27 nm. 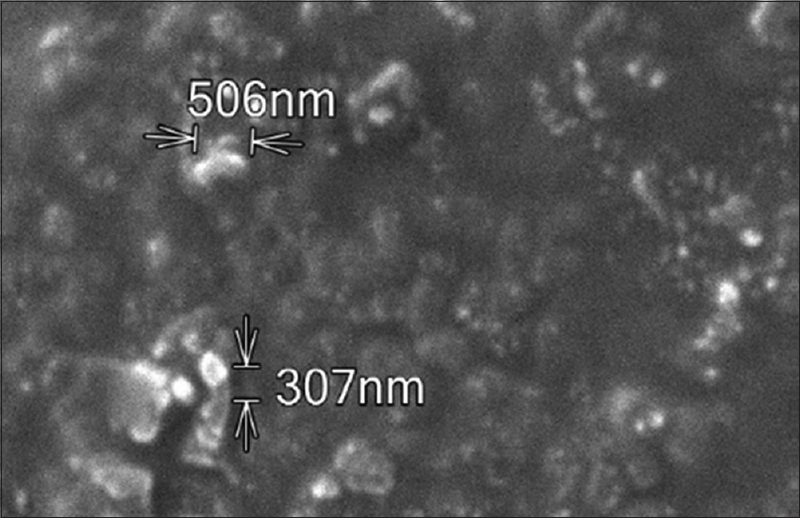 SEM images of the Chitosan-P. merkusii extract nanoparticles showed an irregular shape, and the morphology surface showed the rough surface. Injection of lead acetate (15 mg/Kg BW) for 7 days resulted in a significant (P < 0.05) increase in SGOT, SGPT, ALP, MDA level, and caspase-3 expression. Lead acetate also significantly (P < 0.05) decreased in SOD and GPx. Treatment with the Chitosan-P. merkusii extract nanoparticle (400 mg/Kg BW) significantly (P < 0.05) decreased the elevated SGPT, SGOT, ALP, MDA levels, and caspase-3 expressions as compared to lead acetate group. Treatment with Chitosan-P. merkusii extract nanoparticle (400 mg/Kg BW) also resulted in a significant (P < 0.05) increase in SOD and GPx, as compared to lead acetate group. 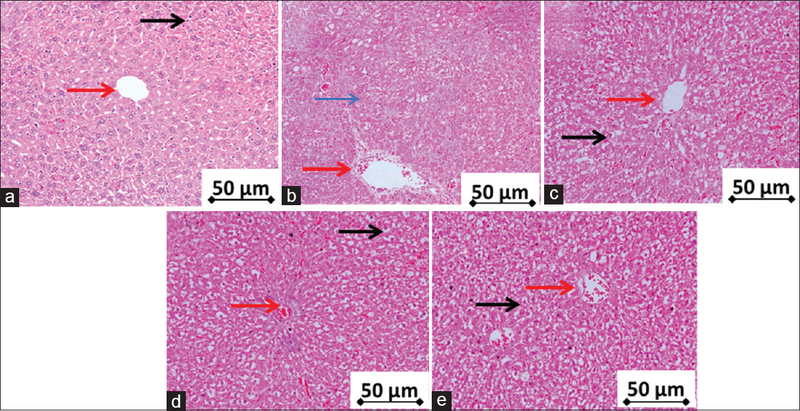 Administration of lead acetate to rats can cause histopathological changes such as loss of the normal structure of hepatic cells, blood congestion, and necrosis whereas rats treated with Chitosan-P. merkusii extract nanoparticle showed an improvement in these changes, and the tissue appears with normal structures. Conclusion: This study indicates that Chitosan-P. merkusii nanoparticle could be a potent natural product that provides a promising hepatoprotective effect against lead acetate-induced hepatotoxicity in rats, through increasing antioxidant and inhibiting caspase-3 expression. Abbreviations used: DLS: Dynamic light scattering; SEM: Scanning electron microscope; SGOT: Serum glutamic-oxaloacetic transaminase; SGPT: Serum glutamic-pyruvic transaminase; ALP: Alkaline phosphatase; MDA: Malondialdehyde; SOD: Superoxide dismutase; GPx: Glutathione peroxidase; ROS: Reactive oxygen species; CAT: Catalase; BW: Body weight. Background: Hepatocellular carcinoma is one of the most common types of malignancy and causes significant morbidity and mortality worldwide. Gracilaria foliifera (Forssk.) Børgesen, a brown marine alga, is shown to have growth inhibitory potential against various cancer cell lines other than human hepatoma HepG2 cells. Objective: To investigate the cytotoxic potentials of G. foliifera in HepG2 cells. 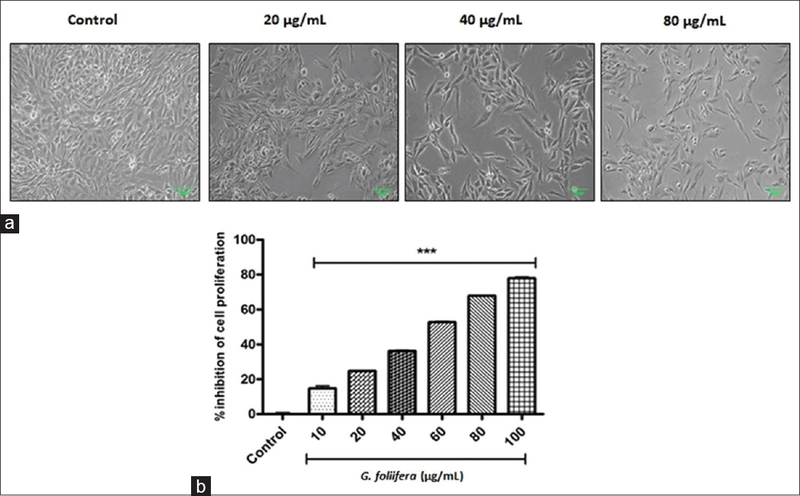 Materials and Methods: HepG2 cells were fed with culture medium supplemented with different concentrations of ethanolic extract of G. foliifera (20, 40, and 80 μg/mL). After 24 h of treatment, the cytotoxicity was evaluated by 3-(4,5-dimethylthiazol-2-yl)-2,5-diphenyltetrazolium bromide assay. Induction of early apoptosis was investigated by annexin V-fluorescein isothiocyanate immunofluorescence. Induction of late apoptosis and necroptosis was investigated by annexin V and propidium iodide (PI) staining. Nuclear chromatin condensation was evaluated by Hoechst staining. p53 protein expression was analyzed using Western blotting. Results: G. foliifera treatment in HepG2 cells caused a significant cytotoxic effect. Phosphatidylserine translocation confirms the induction of early apoptosis. Analysis of late apoptosis using annexin V/PI staining showed that the percentage of apoptotic cells was increased in a concentration-dependent manner. Hoechst nuclear staining further confirms the nuclear chromatin condensation. G. foliifera treatment also induced the tumor suppressor p53 protein expressions. Conclusion: The present study demonstrated that G. foliifera induced apoptosis in HepG2 cells through activation of p53. Abbreviations used: HCC: Hepatocellular carcinoma; DMEM: Dulbecco's minimum essential medium; MTT: 3-(4,5-dimethylthiazol-2-yl)-2,5-diphenyltetrazolium bromide; NCCS: The National Center for Cell Science; FBS: Fetal bovine serum; PI: Propidium iodide; PS: Phosphatidylserine. Background: Calotropis gigantea (L.) Dryand, belonging to the family Apocynaceae is a source of many bioactive cardenolides. However, inadequate accumulation of these cardenolides within this plant restricts their economic isolation. Due to multiple chiral centers, these metabolites could not be chemically synthesized so far. 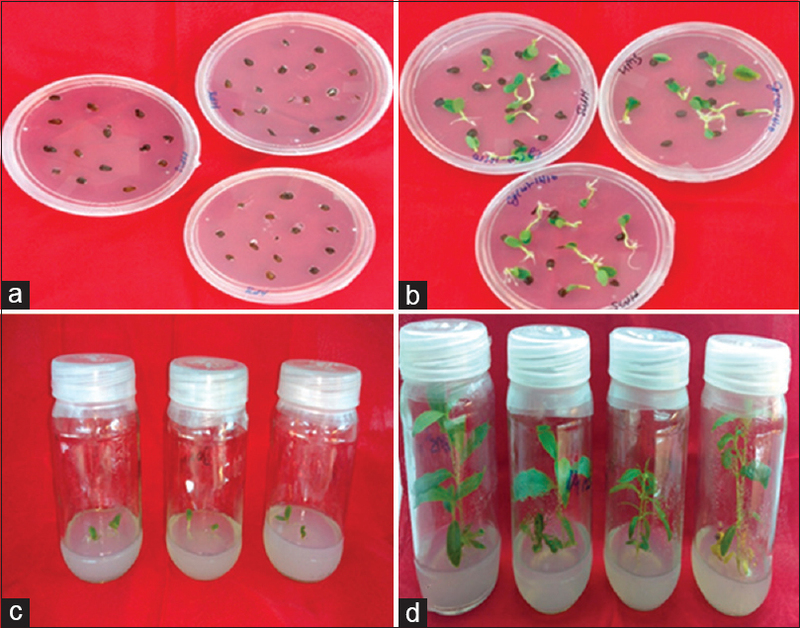 Objective: The main objective of this study was to develop protocols for enriched production of targeted bioactive cardenolides within in vitro grown plant system. Materials and Methods: In our study, we established in vitro plantlets from the seeds of naturally grown plants. Various biotic and abiotic elicitors, as well as precursors with different concentrations and incubation period, were used for the same. Results: It was observed that the in vitro grown control plantlets could biosynthesize a higher quantity of seven bioactive cardenolides than the naturally grown plants, whereas only coroglaucigenin was in less quantity. All the eight cardenolides could further successfully be enriched through our experiments. 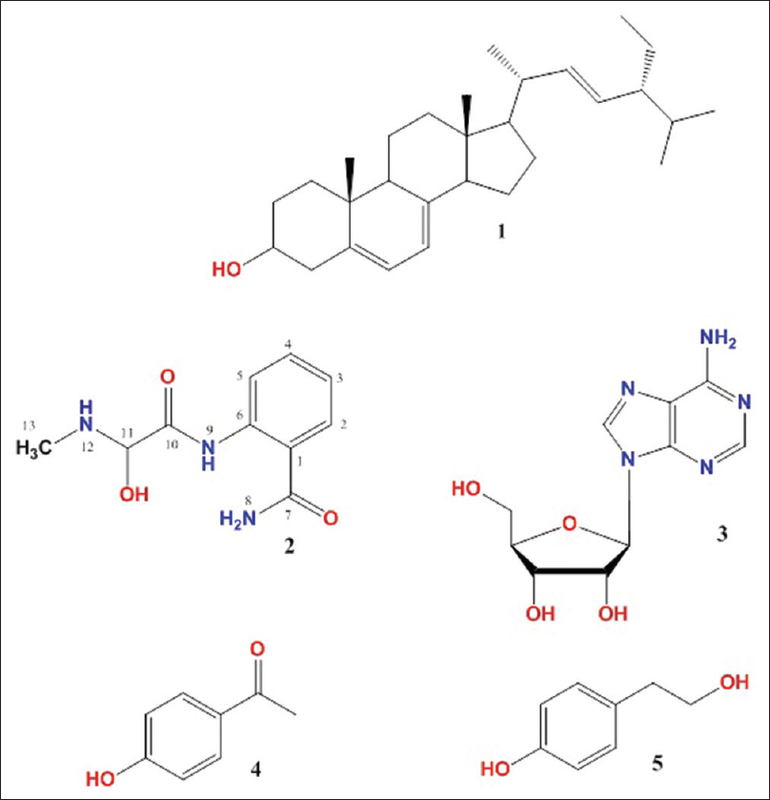 Uscharidin could be enriched significantly to a maximum level (~17-fold) followed by calotropagenin (~11-fold), uzarigenin (~8.5-folds), calotropin (4.5-fold), frugoside (~4-fold), uscharin (3.8-fold), asclepin (~2-fold), and coroglaucigenin (~1.5-fold) when they were compared to their maximum accumulation in naturally grown plants. For effective quantitative calculation of natural abundance of cardenolides within naturally grown plant, their seasonal variations were carried out using ultra high-performance liquid chromatography-mass spectrometry. Conclusion: From the above results, it can be concluded that the in vitro grown plantlets are the better choice than the naturally grown plants for enriched production of cardenolides. Elicitors were found more effective than precursors for the same. Abbreviations used: CGs: Cardiac glycosides; CH: Cholesterol; CHI: Chitosan; DDW: Double distilled water; MJ: Methyl Jasmonate; PG: Progesterone; SA: Salicylic acid; SQ: Squalene; YE: Yeast extract. Background: Three key coumarinolignoids, cleomiscosins A, B, and C of Cleome viscosa seed origin in particular ratio, are a proven hepatoprotective agent known as Cliv-92. Objectives: However, the bioavailability and pharmacokinetics of Cliv-92 are still not clear. The present study is the first validated method which deals with the assay of Cliv-92 in mouse plasma. Methods: Single-step sample preparation meets the criteria of recovery (80%–93% with relative standard deviation [RSD] 2.14%–4.80%). Reverse-phase high-performance liquid chromatography with photodiode array detection has resulted into acceptable separation and sensitivity of three structurally similar cleomiscosins – A, B, and C of Cliv-92. The analysis involved a binary gradient of mobile phase and flow rate. Quantification was done at peak area at 326 nm using linear regression curve (r2 > 0.999). The precision (0.46%–2.68% RSD) and accuracy (±2.09% bias) of Cliv-92 determination in plasma complied the criteria of the current international guidelines. We have also evaluated the matrix effect on sensitivities by spiking method. Limit of detection and limit of quantification in mouse plasma ranged between 0.13–0.24 μg/ml and 0.41–0.74 μg/ml. Results: Pharmacokinetic parameters were studied after intravenous bolus administration of Cliv-92 at 10 mg/kg dose in mice. Blood samples were collected at a predefined time up to 24 h post-injection. The Cliv-92 plasma half-life (t1/2) was 2.77 h, and the clearance was estimated as 2.38 L/h/kg. Conclusion: The method is simple, sensitive, and accurate for the determination of plasma concentration of coumarinolignoids. 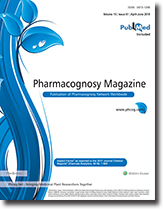 The present preclinical pharmacokinetic study of coumarinolignoids has been anticipated in clinical studies with scaling techniques. Abbreviations used: HPLC-PDA: High Performance Liquid Chromatography-Photodiode Array; HQC: High-Quality Control level; LOD: Limit of Detection; LOQ: Limit of Quantification; LQC: Low-Quality Control level; MQC: Medium-Quality Control level; QC: Quality Control; RT: Room Temperature. Background: Exposure to cadmium (Cd) is a major environmental pollutant that causes injury on many organs and tissues, particularly the liver. However, the protection of radish seed aqueous extract (RSE) against hepatic injury in Cd-exposed mice yet remains unclear. Objective: The research aimed to investigate the mitigation effect of RSE against Cd-induced hepatotoxicity in experimental animals. 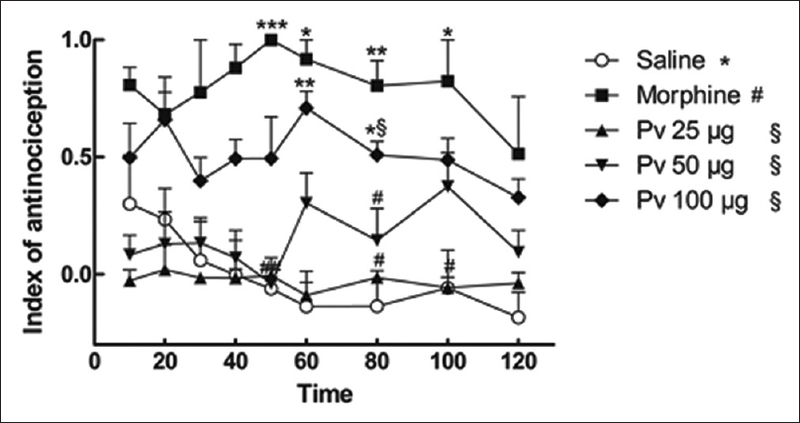 Materials and Methods: The mice were administered intraperitoneally with Cd Chloride (CdCl2, 75 mg/kg b. wt) as a positive control to compare RSE. The hepatic function and antioxidant status were assessed in liver tissue of poisoned and control mice. 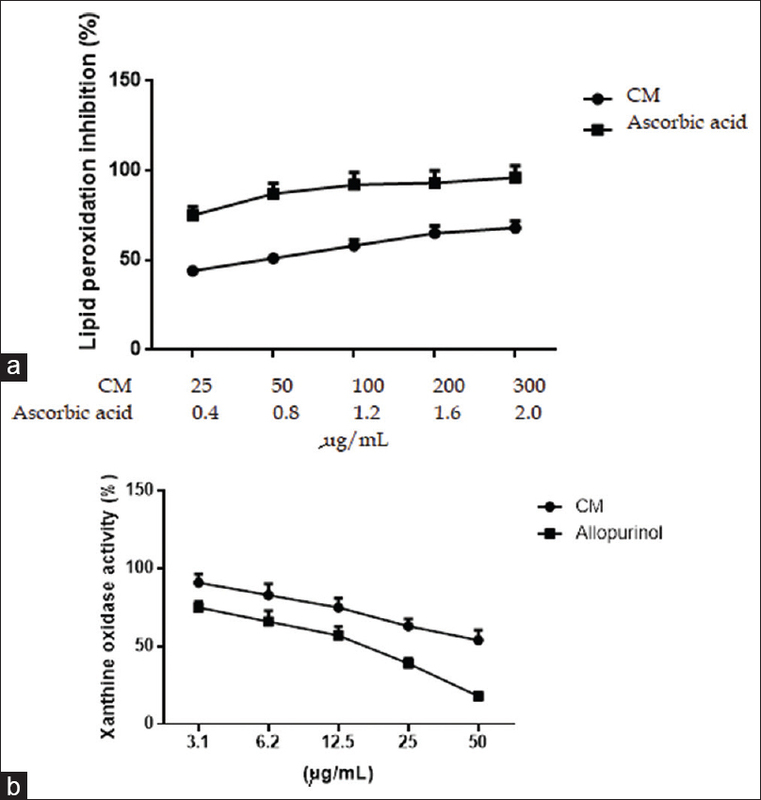 Results: Levels of serum hepatic enzymes (aspartate transaminase: AST and alanine transaminase: ALT) as well as total bilirubin were significantly increased in Cd-exposed mice. In addition, Cd exposure elicited enhancement of oxidative stress level. Co-treatment with RSE (200 and 400 mg/kg b. wt) significantly decreased the serum levels of liver function biomarkers. Furthermore, RSE treatment showed a significant reduction of lipid peroxidation and increase of enzyme and glutathione concentrations. Histopathological analysis was parallel to these biochemical findings. Conclusion: The results clearly demonstrated that RSE is effective for ameliorating hepatic cytotoxicity and oxidative damage arising from Cd exposure. Abbreviations used: Cd: Cadmium; ROS: Reactive oxygen species; RS: Radish seed; RSE: Radish seed aqueous extract; HPLC: High-performance liquid chromatography; SAE: Sulforaphene; SFE: Sulforaphene; TFC: Total flavonoids content; TPC: Total phenolics content; AST: Glutamic-oxalacetic transaminase; ALT: Glutamic pyruvic transaminase; TB: Total bilirubin; MDA: Malondialdehyde; CAT: Catalase; GPX: Glutathione peroxidase; NOx: Nitrates and nitrites; NO: Nitric oxide; LRS: Low dose of radish seed extract; HRS: High dose of radish seed extract; LPO: Lipid peroxidation; ONOO−: Peroxynitrite radical; iNOS: Nitric oxide synthase. Objective: This study aims to investigate the effect of gardenia/acanthopanax-medicated serum on pheochromocytoma (PC12) cell apoptosis and calcium ion concentration, and explore the antidepression mechanism of gardenia/acanthopanax. Materials and Methods: In this study, PC12 cells were treated with high concentrations of corticosterone to simulate the effect of high level glucocorticoids in neurons in patients with depression. Next, the apoptosis rate of cells, apoptosis-related proteins, and relative intracellular calcium concentration were detected using flow cytometry. Results: Compared with the blank group, the apoptosis rates, pro-apoptotic proteins, and calcium ion concentrations were significantly increased, and the anti-apoptotic proteins decreased in the control groups, and the results were reversed by different drug-medicated serum. Compared with the control groups, the differences in gardenia and fluoxetine groups were statistically significant (P < 0.01) and were more significant than acanthopanax group (P < 0.05); but the differences between the gardenia and fluoxetine groups were not statistically significant (P > 0.05). Conclusion: The results of this study suggest that gardenia/acanthopanax-medicated serum can obviously improve the survival rate of neurons under high concentrations of glucocorticoids, downregulate the apoptosis-related proteins, and reduce the intracellular calcium concentration, and gardenia had better effects than acanthopanax. Abbreviation used: PC12: Pheochromocytoma; GRs: Glucocorticoid receptors; HPLC: High-performance liquid chromatography; DMEM: Dulbecco's modifed eagle medium; HyClone: High glucose medium; PBS: Phosphate buffered saline; SDS: Sodium dodecyl sulfate; PAGE: Polyacrylamide gel electrophoresis; FITC: Fluorescein isothiocyanate; FCM: Flow cytometry; MR: Mineralocorticoid receptor; HPA: Human platelet antigens; NMDA: N-methyl-D-aspartate; nNOS: Nervous nitric oxide synthase; PS: Phosphatidylserine. Objective: Fexofenadine is an anti-allergy drug frequently used to treat rhinitis, which is absorbed through organic-anion-transporting polypeptide (OATP) 1A2 in the intestine. Clinical studies have revealed that grapefruit juice inhibits OATP1A2 to reduce the absorption of fexofenadine. In Japanese traditional Kampo medicine, shoseiryuto, a formula composed of eight crude drugs, is frequently used to treat allergic rhinitis, especially cases of pollinosis. The objective of this study is to present the drug information regarding the interaction between shoseiryuto and fexofenadine through OATP1A2. Materials and Methods: We established human embryonic kidney 293 cells stably expressing OATP1A2 and evaluated the inhibitory effects of the extracts of shoseiryuto and its herbal components on the uptake of fexofenadine into the cells. Results: Shoseiryuto extract inhibited fexofenadine uptake in a concentration-dependent manner with an IC50 value of 238 μg/ml. The inhibitory titer of shoseiryuto was much lower than that of grapefruit juice, and it is predicted that shoseiryuto could not pharmacokinetically interact interaction with fexofenadine through OATP1A2. Among the eight herbal components of shoseiryuto, the extracts of the terrestrial stem of Ephedra sinica and the root and stolon of Glycyrrhiza uralensis inhibited fexofenadine uptake with IC50 values of 102 and 89 μg/ml, respectively. We isolated catechin as the active ingredient from the extract of the terrestrial stem of E. sinica. Catechins inhibited the uptake of fexofenadine in a concentration-dependent manner, and the IC50 values of epicatechin (EC) gallate, epigallocatechin (EGC) gallate, EGC, catechin, and EC were 11, 26, 41, 52, and 96 μM, respectively. Conclusion: These results would contribute to the safe and effective use of shoseiryuto in clinics. Abbreviations used: CYP: Cytochrome P450; JPXVII: The 17th Edition of the Japanese Pharmacopoeia; EC: Epicatechin; ECG: Epicatechin gallate; EGC: Epigallocatechin; EGCG: Epigallocatechin gallate; HBSS: Hanks' balanced salt solution; HEK: Human embryonic kidney; OATP: Organic-anion-transporting polypeptide; PBS: Phosphate-buffered saline; PHB: p-hydroxybenzoic acid butyl ester. Background: Doxorubicin (DOX) is a widely used anthracycline-based anticancer agent, which causes a gradual decline in cognition on long-term usage in breast cancer patients that affect their quality of life negatively. Aim: The present study was designed to assess the neuroprotective potential of Saraca asoca bark against Dox-induced neurotoxicity, considering its previously reported anticlastogenic effect. Materials and Methods: Methanolic extract of bark was prepared by Soxhlet extraction and characterized by high-performance thin-layer chromatography (catechin-8.82%). In vitro studies were performed in IMR-32 neuroblastoma cells using cell viability and neurite growth assay to determine the neuroprotective potential of the extract against DOX-induced neurotoxicity. In vivo neuroprotection study of extract (100 and 200 mg/kg p. o) was performed by assessing episodic memory through novel object recognition test (NORT) in DOX-induced (10 cycles, 2.5 mg/kg, 5 days apart) memory deficit model. In addition, antioxidant markers and acetylcholinesterase activity in hippocampus and frontal cortex were evaluated. Results and Conclusion: The extract showed significant in vitro neuroprotection toward differentiated cells in morphological features and cell viability assessment against DOX (IC50-63.35 and 45.17 μg/ml against 1 μg/ml and 2 μg/ml DOX, respectively, and 0.46 μg/ml for DOX alone in 3-[4,5 dimethyl thiazol-2-yl]-2,5-diphenyl tetrazolium bromide assay). DOX-treated animals showed depletion in episodic memory while extract at 100 mg/kg significantly prevented it. Similar changes were observed in antioxidant markers levels in the brain. DOX treatment elevated acetylcholinesterase activity which was significantly reversed by the treatment with extract. Thus, it can be stated that the neuroprotective and antioxidant potentials of extract possibly underlie the efficacy against the DOX-induced neurotoxicity. Abbreviations Used: DOX: Doxorubicin; S. asoca: Saraca asoca; DMEM: Dulbecco's Modified Eagle's Medium (DMEM); MTT: 3-[4,5 dimethyl thiazol-2-yl]-2,5-diphenyl tetrazolium bromide; FBS: Fetal bovine serum; RA: Retinoic acid; CMC: Carboxymethyl cellulose; SOD: Superoxide dismutase; GSH: Reduced glutathione; HPTLC: High-performance thin-layer chromatography; NORT: Novel object recognition task; ITI: Intertrial interval; MPO: Myeloperoxidase; MDA: Malondialdehyde; RI: Recognition index; DI: Discrimination index. Context: Corylopsis coreana Uyeki (Korean winter hazel) belongs to the Hamamelidaceae family. It is cultivated as an ornamental plant in South Korea. In traditional folk medicine, C. coreana has been used to treat irritated skin and inflammatory diseases. Aims: To study the anti-inflammatory effects of C. coreana Uyeki leaf and bark extracts as well as their major active compounds, we evaluated in vitro levels of tumor necrosis factor-α (TNF-α), interleukin-6 (IL-6), and nitric oxide (NO) using RAW 264.7 macrophages. Materials and Methods: Production of TNF-α and IL-6 cytokines was measured by ELISA assay, and NO inhibitory activity was tested by Griess assay. Results: Extracts of leaves and barks, as well as isolated compounds from these extracts, showed remarkable anti-inflammatory activities by inhibiting NO, TNF-α, and IL-6 cytokine production. In particular, the leaf extract showed more potent inhibitory activities than that of barks. Conclusions: Ellagitannins and flavonoids were probably related to the anti-inflammatory activity of CL (leaves) extract, providing evidence of the anti-inflammatory property of CL. Abbreviations used: TNF-α: Tumor necrosis factor-α; IL-6: Interleukin-6; CL: Corylopsis coreana; NO: Nitric oxide; LPS: Lipopolysaccharide; Tel 1: Tellimagrandin I; Tel 2: Tellimagrandin II; Cas: Casuarinin; Quer: Quercetin; EGCG: Epigallocatechin gallate. Background: Chronic pain is an urgent medical problem worldwide, resulting in long-term sick leave, low quality of life, and high socioeconomic costs. Despite the physiological, emotional, and financial burden of chronic pain, there is still a lack of efficient treatments. In this context, toxins isolated from arthropods are considered powerful tools because they have targets that are compatible with the impulse transmission of pain and can provide an interesting alternative in the development of more efficient analgesic treatments. Wasps are arthropods with potent venom that contains a complex mixture of compounds, including biogenic amines, proteins, and peptides. For decades, chemical identification and biological characterization of wasp venom peptides have accumulated considerable attention from researchers. Objective: The objective of this work was to evaluate the antinociceptive activity of the peptide fraction (Fpep) from low-molecular-weight compounds (LMWCs) from the venom of the Brazilian social wasp Pseudopolybia vespiceps testacea. Materials and Methods: P. vespiceps females were collected, and after euthanasia by freezing (−20°C), a total of 148 venom sacs were used to acquire only compounds with LMWCs. The antinociceptive effect of the Fpep from LMWCs was observed by two thermal tests: tail flick and hot plate measured in male Swiss mice. Results: Fpep showed dose-dependent antinociceptive activity in mice submitted to intracerebroventricular injection in two different models. Conclusion: These results revealed the significant potential impact of the LMWCs of the venom of Pseudopolybia vespiceps testacea, including neuroactive peptides that can be used as pharmacological resources for antinociceptive drug research. Abbreviations used: ACN/H2O: Acetonitrile/deionized water; CEUA: Committee for Ethics in Animal Use; CNS: Central nervous system; Fpep: Peptide fraction; i.c.v: Intracerebroventricular; LMWCs: Low-molecular-weight compounds; P. vespiceps: Pseudopolybia vespiceps testacea. Background: Oxidative stress induced by the excessive reactive oxygen species (ROS) generation is involved in the pathogenesis of various diseases. Methanol extract from Cucurbita argyrosperma (CM) was used to test for antioxidant and antioxidative stress. Materials and Methods: The radical scavenging potential was determined using eight different in vitro assays: 1,1-diphenyl-2-picrylhydrazyl (DPPH), 2,2'-Azino-bis-3-ethylbenzothiazoline-6-sulfonic acid (ABTS) radical, β-carotene-linoleic acid, chelating activity, ferric reducing antioxidant power (FRAP), hydroxyl radical, nitric oxide (NO) radical, and superoxide anion radicals, palmitate (PA) on H9c2 cells, and H2O2-induced cell damage on H9c2 cardiomyocytes. Results: CM showed antioxidant activity with DPPH radical values of EC507.6 ± 5.38 mg/mL, β-carotene-linoleic acid EC50 of 279.4 ± 36.32 mg/ml, chelating activity EC50 of 301.2 ± 9.78 mg/ml, FRAP EC50 of 101.3 ± 3.10 mg/ml, hydroxyl EC50 of 42.6 ± 8.6 mg/mL, superoxide EC50 of 50.6 ± 8.66 mg/ml, NO EC50 of 101.2 ± 19.74 mg/ml, and ABTS EC50 of 13.2 ± 4.9 mg/ml. The methanol extract preincubation decreases the intracellular ROS induced by H2O2 and PA in H9c2 cells in a concentration-dependent manner. The methanol extract could also protect H9c2 cells and inhibit the activity of xanthine oxidase, malondialdehyde, and lactate dehydrogenase which increases cell viability, heme oxygenase-1, glutathione/oxidized glutathione, superoxide dismutase-1, catalase, and GSH-Px? levels. Conclusions: The finding suggests that methanol extract can protect the oxidative stress-induced cardiomyocyte damage through ROS regulation and can be used as a therapeutic agent for the improvement of oxidative stress in various diseases. Abbreviations used: ABTS radical: 2,2'-Azino-bis-3-ethylbenzothiazoline-6-sulfonic acid; CAT: Catalase; DCFH-DA: 2',7'-dichlorodihydrofluorescein diacetate; DMSO: Dimethyl sulfoxide; MTT: 3-(4,5-dimethylthiazol-2-yl)-2,5-diphenyltetrazolium bromide; DPPH: 1,1-diphenyl-2-picrylhydrazyl; DCFH-DA: 2',7'-dichlorofluorescin diacetate; FRAP: Ferric reducing antioxidant power; GSH: Glutathione; GSH-Px: Glutathione peroxidase; HO-1: Heme oxygenase-1; OH−: Hydroxyl; LDH: Lactate dehydrogenase; LOOH: Lipid peroxide; LOO•: Lipid peroxyl; MDA: Malondialdehyde; NO: Nitric oxide; GSSG: Oxidized glutathione; O2−1: Oxygen; O3 Ozone; PA: Palmitate; RO2−: Peroxyl; PBS: Phosphate-buffered saline; ROS: Reactive oxygen species; O2•: Superoxide; SOD: Superoxide dismutase; TFs: Total flavonoids; TP: Total phenolic; TCA: Trichloroacetic acid; XO: Xanthine oxidase. Background: Astragali Radix, the dried root of Astragalus membranaceus Bunge, is a widely used herbal and traditional medicine and is viewed as a primary energizing medicinal herb that invigorates vital energy. Objective: We investigated the effects of Astragali Radix administered on ischemia-induced brain injury in a mouse model. Materials and Methods: Ischemic brain injury was induced by middle cerebral artery occlusion (MCAO) for 2 h. Methanol extracts of Astragali Radix (Amex) were then orally administered daily for 3 days. Relative cerebral blood flow was measured under ischemic conditions. Infarct volumes were measured by triphenyltetrazolium chloride staining. Changes in brain edema, brain water content, and neurological deficit (ND) scores were also measured. Aquaporin-4 (AQP-4) protein and mRNA expression were evaluated and histological changes visualized by staining with hematoxylin and eosin or cresyl violet. Results: Oral administration of Amex for 3 days after MCAO significantly reduced brain infarct volumes, edema indices, and water contents and suppressed the expression of AQP-4 at the protein and mRNA levels. However, MCAO-induced increases in ND scores were not ameliorated by Amex. Conclusion: Oral administration of Amex following onset of brain injury reduced infarct volume and brain edema. Our results suggest that reduction of AQP-4 protein and mRNA expression is a possible mechanism for these effects. Abbreviations used: r-tPA: Recombinant tissue plasminogen activator; BBB: Blood–brain barrier; Nrf2: Nuclear factor erythroid 2-related factor 2; Foxp3: Forkhead box P3; VEGF: Vascular endothelial growth factor; MMP-9: Matrix metallopeptidase-9; TRPC6: Transient receptor potential cation channel subfamily C member 6; p-CREB: Phospho-cyclic AMP response element binding; JNK3: C-Jun N-terminal kinase 3; SPF: Specific-pathogen-free; DMSO: Dimethyl sulfoxide; TTC: 2,3,5-triphenyltetrazolium chloride; PBS: Phosphate-buffered saline; PFA: Paraformaldehyde; OCT: Optimum cutting temperature; AQP-4: Aquaporin-4; SDS-PAGE: Sodium dodecyl sulfate-polyacrylamide gels by electrophoresis; PVDF: Polyvinylidene difluoride; RT-PCR: Reverse transcription polymerase chain reaction. Background: Alcohol is a major contributor of chronic liver disease worldwide. Medical treatment for alcoholic liver disease (ALD) is limited. Due to the roles of oxidative stress in the development of ALD, genistein, a natural antioxidant, might be beneficial in alleviating alcohol-induced liver injury. Materials and Methods: Eighteen male Sprague–Dawley® rats were divided into three groups (n = 6 each). Control group received distilled water, while alcohol group received 50% alcohol (8 g/kg body weight [BW] per day), and genistein group received genistein (16 mg/kg BW per day) dissolved in 50% alcohol (8 g/kg BW per day) for 4 weeks. At the end of the study, liver tissue was obtained for histopathology and immunohistochemistry for interleukin-18 (IL-18), hepatic malondialdehyde (MDA), and glutathione (GSH) measurement. Serum samples were analyzed for alanine transaminase (ALT) and tumor necrosis factor-α (TNF-α). 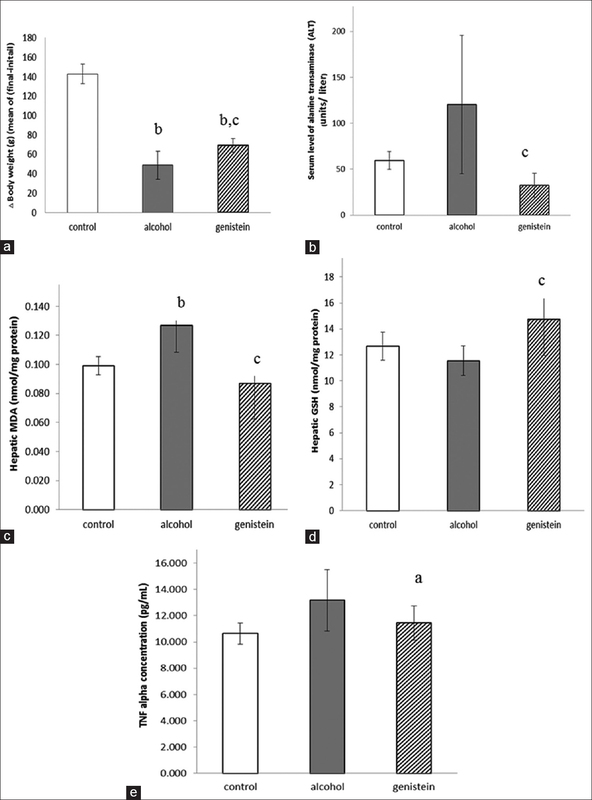 Results: Alcohol-fed rats gained significantly less weight than control and genistein ones (48.83 ± 14.59, 142.83 ± 10.06 vs. 69.17 ± 7.33 g, respectively, P < 0.01). Serum ALT levels were also significantly lower in genistein group than in alcohol group (32.43 ± 12.90 vs. 120.30 ± 75.30; P < 0.05). Hepatic MDA levels were higher in alcohol group (0.13 ± 0.02 nmol/mg protein), while the levels were comparable between genistein (0.09 ± 0.02 nmol/mg protein) and control groups (0.1 ± 0.01 nmol/mg protein). There was a trend toward a decrease in GSH levels in alcohol-fed rats as compared to control ones. On the contrary, GSH levels were significantly increased in GSH-treated rats. Markers of inflammatory responses, such as IL-18 and TNF-α, were higher in alcohol group and declined toward the control group with genistein administration. Conclusion: Alcohol-induced hepatic cell damages through oxidative stress and inflammatory responses. Genistein could alleviate alcohol-induced liver injury through its antioxidant and anti-inflammatory properties. Abbreviations used: ALD: Alcoholic liver disease; NAFLD: Nonalcoholic fatty liver disease; ALT: Alanine transaminase; TNF-α: Tumor necrosis factor-alpha; IL-18: Interleukin-18; LPS: Lipopolysaccharide; MDA: Malondialdehyde; GSH: Glutathione; TBARS: Thiobarbituric acid-reactive substances; ELISA: Enzyme-linked immunosorbent assay; DMSO: Dimethyl sulfoxide; DAB: Diaminobenzidine. Background: Euphorbia humifusa Willd. (EH) is a kind of Chinese medicinal plant belonging to the family Euphorbiaceae, which is traditionally used for influenza, jaundice, hepatitis B virus, hypotension, inflammation, etc. In a modern study, active ingredients of EH reported to exhibit antioxidant, anticancer, and other properties. However, there are few reports showing that EH and its active compounds have inhibitory effects on cervical cancer through autophagy and apoptosis. Objective: To evaluate the anticervical cancer activity of EH and its main active ingredient Gallic acid (GA) by studying on autophagy and apoptosis of normal rat kidney (NRK) and HeLa cell lines, respectively. Materials and Methods: GA, kaempferol (KA), and quercetin (QU) are the main active compounds of EH. Identification and quantification of three substances from four batch samples obtained from four areas in Xinjiang were analyzed by high-performance liquid chromatography with diode-array detection. The potent effects of EH on anticervical cancer were investigated through autophagy and apoptosis in HeLa and NRK cells with varying concentrations of extracts and active compound GA treatment. The antiproliferation activity against HeLa cells was evaluated by 3-(4,5-dimethyl-2-thiazolyl)-2,5-diphenyl-2H-tetrazolium bromide assay. Autophagy and apoptosis in NRK and HeLa cells were observed by laser scanning confocal microscope. Quantitative data of apoptosis were estimated by Hoechst staining and Annexin-V binding assay using flow cytometry. The expression levels of autophagy-related protein (LC3 and P62) were subjected to western blot. Moreover, the autophagic vacuoles and other ultrastructures of cells were observed under transmission electron microscopy. Results: The contents of GA, KA, and QU were measured as 2.3342–3.4688, 0.4636–1.5922, and 0.9349–3.1500 mg/g, respectively. We used different concentrations of GA and the extracts of EH to treat with the line of cells, respectively. The best concentration of GA, water, and ethanol extracts inducing autophagy was 25 μg/ml, 10 mg/ml, and 10 mg/ml, respectively. The autophagy mediated with EH induced the accumulation of autophagosome, and even resulted in apoptosis. Conclusion: From our study, these results indicated that EH and GA may induce both autophagy and apoptosis in NRK and HeLa cells. The activity we studied on autophagy and apoptosis of HeLa cells may provide a new foundation for cervical cancer therapy or other related applications. Abbreviations used: EH: Euphorbia humifusa Willd. ; HPLC-DAD: High-performance liquid chromatography with diode-array detection; NRK: Normal rat kidney; GA: Gallic acid; FC: Flow cytometry; LSCM: Laser scanning confocal microscope; MTT: 3-(4,5-dimethyl-2-thiazolyl)-2,5-diphenyl-2H-tetrazolium bromide; TEM: Transmission electron microscopy; KA: Kaempferol; QU: Quercetin; LC3: The light chain 3; DMEM: Dulbecco's Modified Eagle's medium; FBS: Fetal bovine serum; DMSO: Dimethyl sulfoxide; PBS: Phosphate-buffered saline; PI: Propidium iodide; IC50: Half-maximal inhibitory concentration; BFA: Bafilomycin A1.